Can you customize church furniture to fit any church? Do pew chairs fasten together into rows? Are most church chairs stackable? What is the weight limit for each of your chairs? What quality of foam is in the seats of the chairs? What is the warranty on the chairs? What is the difference between standard and upgrade fabrics? What is the warranty Fabric Warranty? Do we need Scotchguard on the fabric we purchase? What is the production lead-time for completing my order? What is the charge for shipping my order? Is there a deposit required to place my order? Can I delay the delivery of my order? 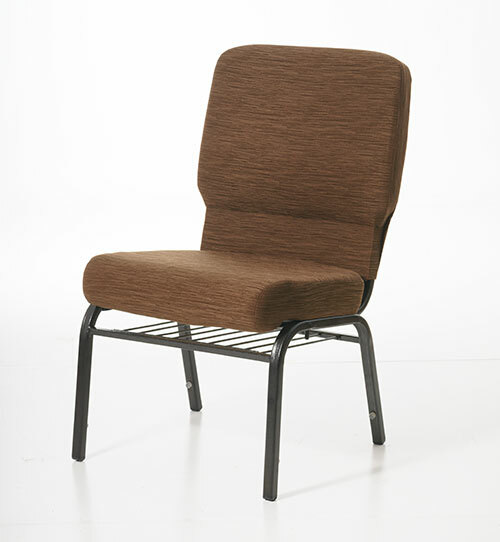 Our full range of chair models and options offer optimized customization for any project. 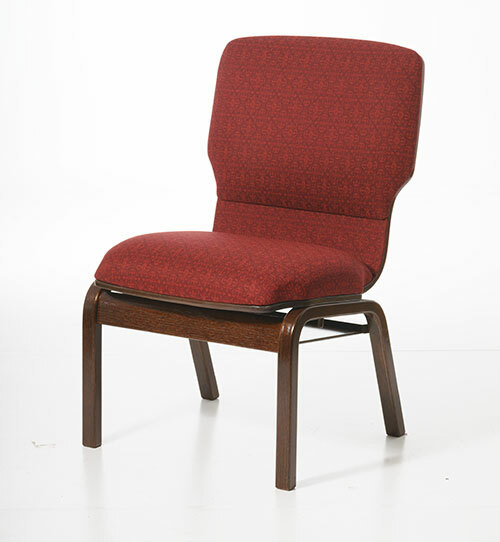 We offer both metal and wood frame worship chairs in a wide variety of fabrics to choose from. 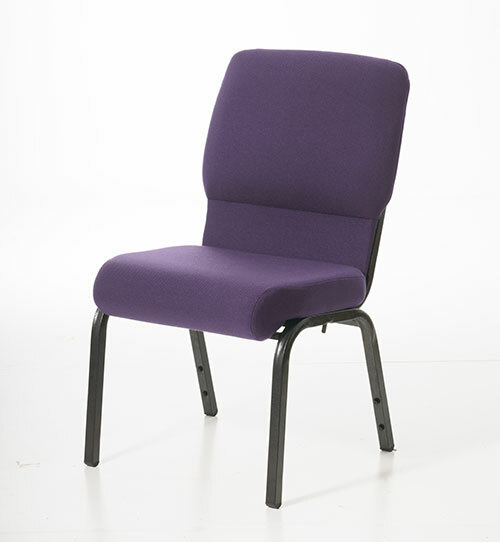 Available chair features include multiple width options, curved or straight backs, and standard or enclosed backs. Additionally, in certain circumstances pitch adjustments can be made to accommodate for churches with sloped flooring. Additional options include armchairs, kneelers, bookracks and card/pencil/cup holders. Our church furniture can be customized to fit the needs, design, and budget of any church. Yes, interconnecting (or ganging) chairs in rows though the use of gangers increases the stability of each chair and restricts individual chair’s movement. Our chairs have the option of a hideaway ganger or the traditional fixed tongue and loop style ganger. The primary function of both styles of gangers is to create rows of connected chairs that allows for the use of many chars in multiple rows while maintaining an orderly appearance. Our chairs feature the unique feature of a hideaway ganger which allows for straight flush fit rows, or radius seating designs. Our exclusive hideaway ganger swivels away when not in use. This is ideal for isle ways. Another advantage to the hideaway ganger is that the chairs can have a multipurpose function as stand-alone chairs with the ganger completely concealed under the frame of the chair. Are most church chairs stackable? How high can we stack the chairs? All of our worship seating is stackable, including our Meridian wood chairs. Stack-ablity is crucial to the versatility of our chairs. Many churches want the ability to change their seating layout for special events, cleaning and storage, as well as having versatility for future needs. We recommend stacks of 5-8 high when transporting on a dolly. However, chairs can be stacked 5-10 high in storage. Not stacking chairs higher than 5-8 high makes moving stacks by dolly simple and accessible for average height people who will be stacking and un-stacking them. We stack the chairs considerable higher, but our staff and equipment is accustomed to maneuvering large stacks of chairs. 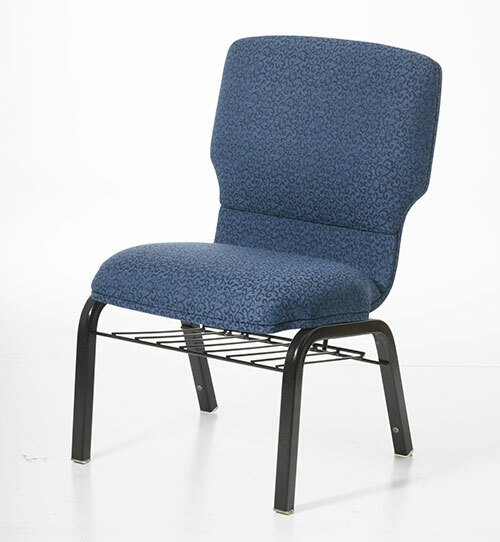 Our metal frame chairs have not been tested to failure, but each will support in excess of 1500lbs. Our wood chairs have been tested to support 800lbs, but will support even more than that. *The real key to the strength of any chair is cross bracing within the frame. Overtime a strong frame that has not been properly reinforced with cross bracing can become weak, creaky, and wobbly, with the potential of a complete failure. The use of abundant cross bracing in our chair frames insures our chairs will withstand the rigors of usage for years to come. Uniflex only uses premium quality foam. Our seat foam is at minimum 2.2 lb virgin polyurethane foam also known as “true urethane density”. We are so confident in the quality and durability of the chairs we manufacture that all of our wood and metal chairs are covered by a lifetime warranty. Our lifetime warranty includes the frame, finish, and even the foam in our chairs. They are warranted against material defect and workmanship issues due to normal use. Please contact us for a copy with full details. All our fabrics are commercial grade. All upholstery materials meet and exceed the minimum requirements to be classified as commercial grade. Our standard fabrics and upgrade categories are based on the cost of the material. Our fabrics are warranted by the fabric manufacturer. Most fabrics are covered by a five to ten year warranty. Please contact us for individual fabric specifications. To help resist stains Scotchguard or Teflon Coating treatments are applied. Treatments wear off with time. In order to be effective these treatments should be reapplied often. Many of our commercial grade fabrics like polypropylene, polyolefin, and nylon are inherently stain resistant and do not require Teflon or Scotchguard treatment. We have chairs in stock and ready for immediate delivery or customer pick- up. Custom orders have an average lead-time of 90 days. Lead-time can vary based on options and colors selected. Please contact us for our current lead-time. Freight is not included in the pricing of our seats. For a freight quote to your location, please contact us by phone or fax. Stock and custom chair orders require a 50% deposit when placing an order. Stock is not pulled or reserved from inventory until paperwork and deposit have been received. All balances should be paid in full prior to shipment of the order. In special instances C.O.D. payment can be arranged with some freight carriers, however the C.O.D. charges will be passed on the customer (charges are 3% - 10% of the balance). We require 60 days notice to reschedule your order. If we do not receive sufficient notice and must store your chairs, a storage fee will be applied to the balance of your order. There is a standard 10% cancellation fee of the entire contract. If the order is in production, the fee will be 25%. The order is in production if the fabric has been received or if any parts have been produced.